After facing off against 47 competitors from around the world, the Caltech Robotics Team won first prize at the 19th annual International RoboSub Competition for autonomous underwater vehicles in San Diego, held from July 25-31. The team's robot submarine, nicknamed "Dory," successfully navigated an obstacle course with tasks that required it to touch buoys, fire torpedoes at targets, and rescue an object underwater—all autonomously. "Not only was Caltech's entry widely acclaimed as the most beautiful robot in the competition, it performed impressive feats of autonomy in the underwater race course, including a double barrel roll through the 'style points' navigation gate," says faculty advisory Joel Burdick, the Richard L. and Dorothy M. Hayman Professor of Mechanical Engineering and Bioengineering in the Division of Engineering and Applied Science. "It's great to see the culmination of all of our efforts," says Tyler Okamoto, a rising senior and the team's project manager, who was one of 18 representatives from Caltech's team at the competition. Caltech had the largest student team to show up to participate in the event of any school, despite having the smallest student body, Burdick notes. The team's students worked around the clock as the competition drew nearer, with the software team making tweaks to the hydrophone system just hours before the race that enabled their victory. "Working with the team during the months and days leading up to the competition reminded me of why I chose a career in academia," Burdick says. "It was such a thrill to be associated with this great group of students." "We are very proud of the win and the exemplary work this team has done," says Guruswami Ravichandran, John E. Goode, Jr., Professor of Aerospace and Mechanical Engineering; and Otis Booth Leadership Chair, Division of Engineering and Applied Science. "The team was exceptional and represented Caltech extremely well." 2016 was only the third year in which a Caltech team of undergraduates entered this competition. The first year, its submarine placed 7th out of 39 teams, winning the "best newcomer" award. The following year, the team's ranking climbed to 4th out of 37. The Caltech team chose to redesign its submarine each year from the ground up—even though teams are allowed to re-enter submarines, tweaking them to build on past successes. This year's submarine, which features seven thrusters, two grippers, a hydrophone, and other sensors, took nine months and about $75,000 to build. One major upgrade for this year's design was a wide-view camera that sits inside a clear plastic bubble and has two axes of rotation that allow the submarine to spot targets without changing orientation; last year's design required the submarine to fire its thrusters and roll and pitch while conducting searches in order to find its targets. The competition's judges noted this as an innovation that had not been seen before at the event. Another major improvement was the addition of a clear acrylic dome on the top of the robot that allowed for easy access to its electronics, allowing the team to make changes without having to do major disassembly and reassembly. The International RoboSub Competition is hosted annually by the Association for Unmanned Vehicle Systems International (AUVSI), a non-profit organization dedicated to advancing the robotics community. In addition to completing the obstacle course, participating teams must generate a technical paper about their submarine, create a video, build a website to track progress, and give a presentation to a panel of judges. For its first-place finish, Caltech's team was awarded the top prize of $6,000. A video of the event can be viewed online at http://www.robonation.org/competition/robosub. The team will reconvene in October to begin planning the next year's robotic submarine. A diver follows Dory as it autonomously searches for its next mission. 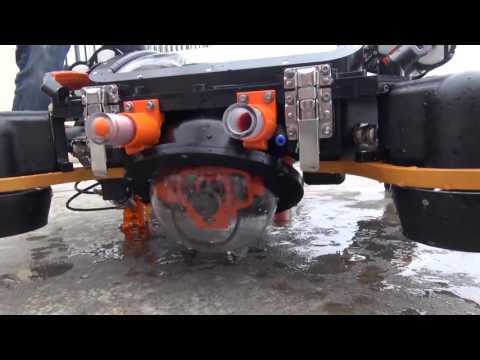 The Caltech Robotics Team wins first place at the International RoboSub Competition.